(a) Truncated systems, often in cities, still operating on tasks associated with the removal of rubble from bombed buildings. (b) Well-laid out contractors' yards still storing locomotives and wagons hopefully for an occasion when they would be needed on some civil engineering project. (c) Groups of quite large locomotives operated by contractors working in quarries of various types. The following notes describe one example from each of these categories. As the DB (Deutsche Bundesbahn) train from Oldenburg ran into Bremen it was possible to see narrow gauge steam locomotives trundling wooden tip wagons of rubble on the west side of the DB line just before the junction with the line from Bremerhaven. This was the 60cm gauge railway operated by Carl Brandt and which formerly ran from bombed sites in the harbour area. At the time of my visit in May 1957 there were still traces of narrow gauge rails across the nearby cobbled streets but the system had been reduced to carrying rubble brought in by lorries to a crushing plant for T. V. G., Bremen, makers of bricks from rubble. From the lorry tipping dock, the loaded wagons were drawn back almost to the road bordering the west of the site. Then they were taken up an incline leading on to the elevated track, supported on a steel bridge-like structure, to the crushing plant. 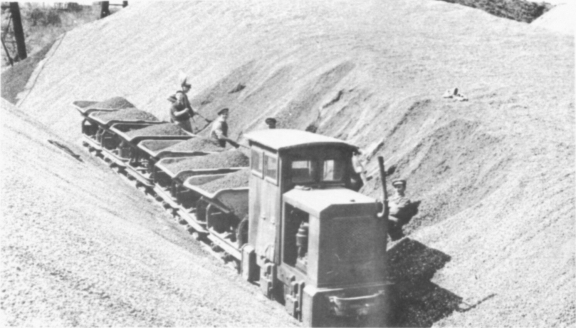 After tipping into the crusher, the empty wagons were taken to the end of the line over Nordstrasse, then pulled back via the south curve of the high level 'triangle', over the dust heaps and back to near the road crossing before finally reversing to come alongside the lorry tipping dock. Two trains followed each other round this circuit, with one usually hauled by a steam locomotive and the other by a diesel. The sequence, as described, meant that the locomotive was always at the same end of the train at the lorry tipping dock. The curved elevated section behind the machine shop appeared to be little used. Presumably in the earlier days of operation, the trains of rubble would have come in from across the streets, up the incline to the crusher, then using the elevated curve so that when they descended to go back across the street the locomotive was still at the head of the train. The crushed rubble was hand-loaded into steel V‑shaped hopper tip wagons hauled by an Orenstein & Koppel 4‑wheel diesel belonging to T. V. G. This company's system seemed very much entangled with that of Carl Brandt. From near the road crossing close to the lorry tip, a line ran south along the foot of the dust heaps and embankments into a compound surrounded by an approximately 8ft high chain link fence surmounted by barbed wire. The compound housed the workshops for the railway and was used to store the wagons and locomotives after work each day. The steam locomotives stood in the open whilst the diesels were placed under an open-sided shelter formed by extending the roof of the workshops which were all built rather roughly of timber. At the southern end of Wesseling station (on the Rheinuferbahn line of the Köln-Bonner Eisenbahnen AG) was a connection for a single standard gauge line into Peter Bauwens' depot on the east side of the station. The standard gauge line terminated at a dock on which were laid, at a height corresponding to that of the floor of a standard DB wagon, mixed narrow gauge track to enable 60cm and 90cm gauge stock to be run end‑on to suitably placed rails on standard gauge wagons. CB 7 (Orenstein & Koppel 12721) in Carl Brandt's compound at Bremen on 15th May 1957. 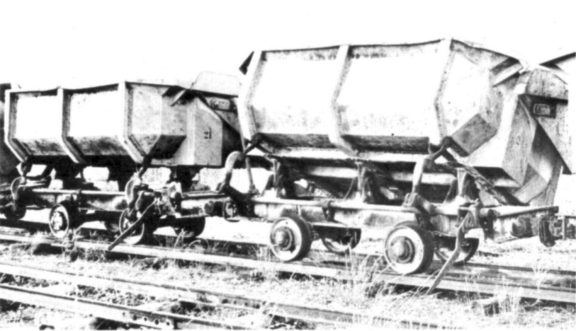 Crushed rubble being loaded into wagons hauled by an Orenstein & Koppel 4‑wheel diesel belonging to T. V. G., Bremen. In the background is the elevated curved track from the crusher of Carl Brandt. Photograph taken on 11th May 1957. 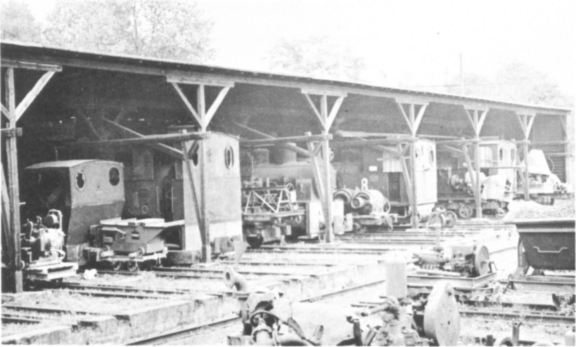 Peter Bauwens' depot at Wesseling on 7th October 1957 showing the traverser track and also (left to right) No.18 (60cm gauge), 18 (90cm gauge) 32, 8 and 9. Some of Christian Krutwig's locomotives in store at Esch on 9th June 1957. (L‑R) 47, 28 (with large "5" site number on cabside), 71, 14, 70, 15 and 55. The mixed narrow gauge track was continued straight back to one side of a traverser, able to move along the whole length of an eleven bay open fronted wooden shed. Most of the bays contained two sets of 90cm gauge tracks but the others had two sets of mixed 60cm and 90cm gauge tracks. There were more mixed gauge storage tracks on the same side of the traverser as the standard gauge loading dock. The outside storage tracks were filled with a vast collection of pumps, compressors, concrete mixers and winches, all mounted on their own rail wagons along with several V‑shaped hopper tipping wagons. Under cover were more rail-mounted items of civil engineering plant but also, in a rather sad state, eight 90cm gauge steam locomotives and two 60cm gauge steam locomotives. Near to Köln and reached by a standard gauge line from the DB about 1km north of Longerich station (on the Köln-Neuss line) was a store of locomotives and wagons belonging to Christian Krutwig, a quarrying and railway building contractor. This store, near gravel pits at Esch, contained seventeen metre gauge and four 60cm gauge steam locomotives. All were standing in the open, most of the larger locomotives on three tracks parallel to the standard gauge line. These metre gauge lines converged to a single line outside a small workshop. At the time of my visit on a Sunday, one of the two locomotives outside the workshop appeared to be undergoing an overhaul. 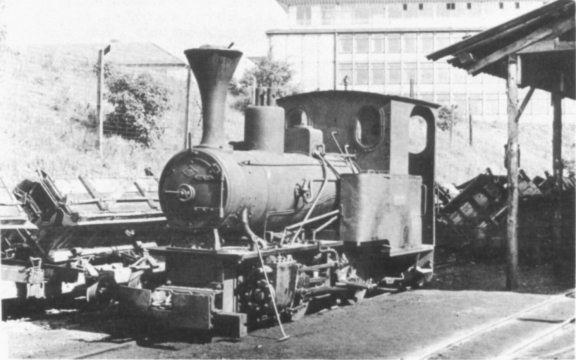 The four narrower gauge locomotives were on very short lengths of track, raised on piles of wooden sleepers and positioned at right angles to the standard gauge line. The wagons were stored on tracks at the side of the minor road from Esch to the Militärring road on the north-west side of Köln. There were two main varieties, both side-tipping. Some were of all metal construction and modern appearance whilst the others, of about the same capacity, were of mainly wooden construction. In both cases, the action of tipping the bodies caused the downward facing side to be lifted so allowing the contents to fall out. 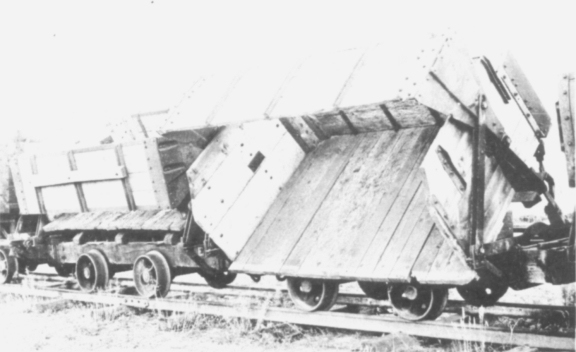 Tipping was effected by a long handle sticking out at right angles to the sides of the wagons. Only the wooden wagons appeared to have brakes and these were worked from a screwed rod and hand lever operated from a small platform across an extension to the main frame members at one end of the wagon. Two of Christian Krutwig's wooden tip wagons in store at Esch on 9th June 1957. Note the linkage for raising the side when the wagon is tipped. Two of Christian Krutwig's steel tip wagons in store at Esch on 9th June 1957. It is not known whether these locomotives and wagons were ever used in the brown coal workings which stretch from south of Köln and in a curve on the west side of that city to near Grevenbroich, about 32km to the north-west. 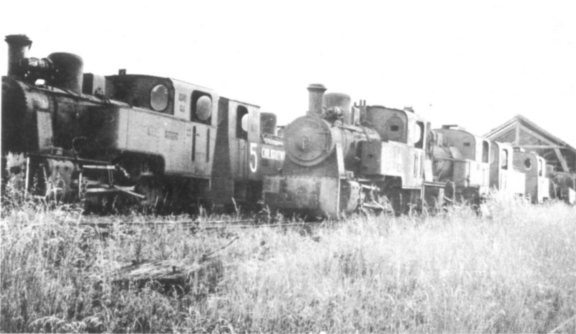 In this fascinating area, both company and quarry contractors' locomotives were very busy in the summer of 1957, but this vast scale of operations is outside the scope of this short article.